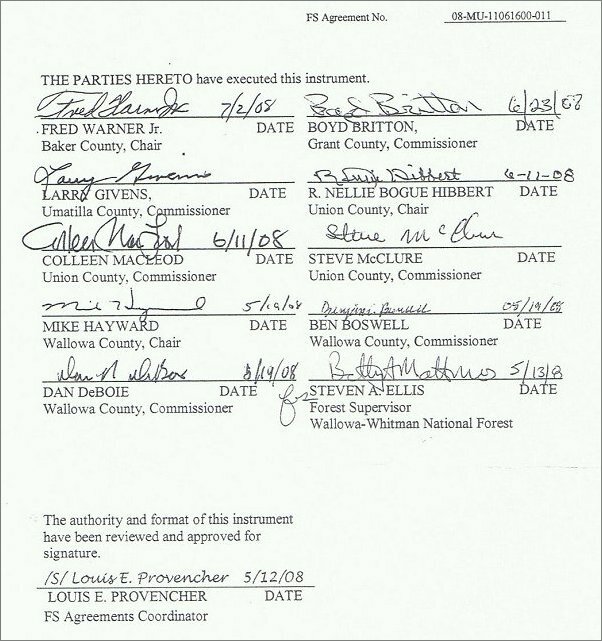 The Baker, Grant, Union, Umatilla and Wallowa County Commissioners signed an agreement with the Wallowa-Whitman National Forest (WWNF) on July 7, 2008, which gave the Forest Service lead agency status on their proposal to significantly amend the Travel Management plan for Forest roads. Under this plan, all areas, trails and roads will be closed, unless these access ways are designated open on a map. By signing the agreement to cooperate with the Forest Service, the five counties have relinquished their governmental status. 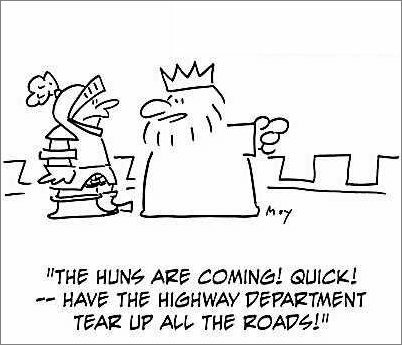 The Forest Service has proposed closing 4,261 miles of Forest roads (about 60% of the 9,300 miles of road on the WWNF) and the counties essentially have said how can we help you get them closed? Throughout the spring and summer of 2007, local residents attended a series of meetings held by the WWNF. The majority of the public attending these meetings voiced their opposition to the Forest Service proposal. One organization, Forest Access for All, circulated a petition that was signed by over 6,000 residents from Baker, Union and Wallowa Counties. The petition opposing the Forest Service plan was submitted to the county commissioners, and the citizens asked for no further road closures. The 2005 National Travel Management Rule, requires all National Forests to regulate travel, but does not require changing any current Forest Plan designations of areas, trails or roads. The intent was to change public access on National Forests in two major areas: there will be no cross-country travel; and public travel will only be allowed on roads and trails designated as open on a Forest map. If a member of the public is found driving on a road without barricades, and that road doesn't happen to be designated as open on the Forest map, that individual will be cited. There are many problems for the public with the travel management plan, however, the very root of the problems stems from the Memorandum of Understanding (MOU) with the Forest Service that the counties signed on July 7, 2008. This agreement gives the Forest Service lead agency status, and lowers the counties' governmental status to that of a cooperating agency. This flies against the powerful, county governmental status which the U.S. Congress conveyed to the local governments under the law. For example, the Federal Land Policy and Management Act 1976 (FLPMA) and the National Environmental Policy Act (NEPA) both require federal agencies to coordinate with local governments concerning land use. These laws do not allow the federal agencies to supercede local planning, but instead, require them to coordinate any management plans in their jurisdictions with local governments. Essentially, the five counties who signed the MOU, became subordinate to the Forest Service. In relinquishing their governmental status, the counties also relinquished their ability to require the Forest Service to come to the counties' table. In the Statute, 16 U.S.C. 1604, the National Forest Management Act (NFMA) directs the U. S. Forest Service, ...the Secretary of Agriculture shall develop, maintain and, as appropriate, revise land and resource management plans for units of the National Forest System, coordinated with the land and resource management planning processes of State and local governments and other Federal agencies. Baker County also violated its own ordinance, Resolution 94-1003, which opposes any land management decisions made by the Forest Service that would further restrict public access to public lands. By signing the MOU, the counties have relinquished their right to appeal the Wallowa-Whitman Travel Management Plan when it is published. Because the counties signed the MOU as subordinate agencies, they cannot appeal the decision for the citizens of their counties. You might be wondering why the counties ever signed the MOU. My understanding is that the counties were approached by the WWNF, and offered a seat at the Forest Service table. The Forest Service had been ignoring the counties until this time, and the counties saw the offer as a chance to be involved in the decisions about their county roads. Unknowingly, the commissioners signed an agreement that rendered the counties subordinate to the Forest Service, and they did this without understanding that they were giving up their powerful county coordination rights. Also, because of the plan to close a majority of the National Forest access roads, concerned citizens began looking at the historic roads across the National Forest, and they began petitioning the County to recognize these as county roads, and require the WWNF to stop closing them. The Forest Service responded in the Record Courier newspaper by threatening Baker County, that if the county asserted authority over RS 2477 roads that the Forest Service had made the decision to close...the issue would ultimately be decided in Federal court Baker County commissioners may have thought that closer communication with the Forest Service through the MOU, would facilitate designation of RS2477 roads without going to court. But whatever the reason, signing the MOU was not a decision that will help the counties keep their Federal lands open for public travel. I believe that the commissioners should notify the WWNF in writing that they wish to rescind their participation under the Travel Plan MOU, and that they should require the Forest Service to coordinate with them. It is time for our commissioners to rediscover their position of power. In addition, they need to familiarize themselves with the Baker County ordinance, Resolution 94-1003, which opposes any land management decisions made by the Forest Service that would further restrict public access to public lands. You can get a copy of the MOU on the website at forestaccessforall.blogspot.com. For more information call the Eastern Oregon Mining Association, at 541-519-7606.